Another year gone where I have taken breath, a breath that has been held while diving into the oceans, a breath that can hasten while riding up steep hills on a bike. A breath that can sing songs with my kids for no other reason than it feels good to sing with them. That same breath that has been granted to me, just got to blow out a candle that signified another year passed, and for that I’m incredibly grateful. I don’t begrudge the late thirties grey hairs, I don’t shower hate on the lined page on which I write my age. I love that I am here. I could easily not be. With my accrued numbers, I’ve played, learnt wonderful new things, talked deep into the night, eaten dishes that have delighted the taste buds, sobbed entire afternoons away, drunk deep weekend coffees in my favourite cup, had three kids that have pushed me to dizzy limits I didn’t know existed, while they’ve also exploded my heart with delirious happiness and exquisite divine love. All of these, along with 68790 daily other things have helped create the evolving lucky layered person I am today. Luck yes. I do feel lucky to be here as so many people who wanted to be, simply aren’t. To be able to age it’s a wonderful and curious thing. So how does it feel to be in my late 30’s? Now I know at whatever number my age may sit, there will always be an endless supply of curiosities to discover, of thoughts to think, and of a diverse array of people to learn from. And with the time that I’m granted? Well I intend to go seek out as many of them as possible, until that simple act of getting older, well it just isn’t an option any longer. A Swedish Pancake Cake seemed like a sensible idea to celebrate another year gone by. This was the first time I had made one, and I’m quietly hooked. 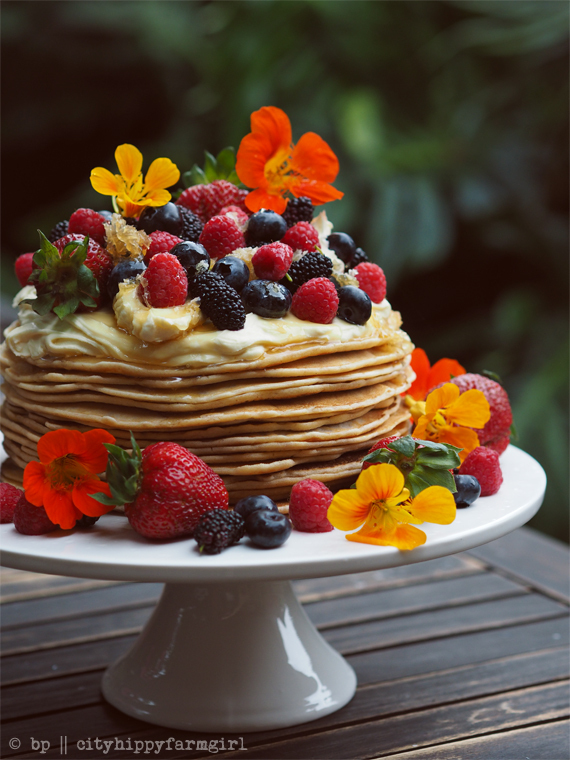 Layered, pancakes, berries, no sugar and a second slice yes please. 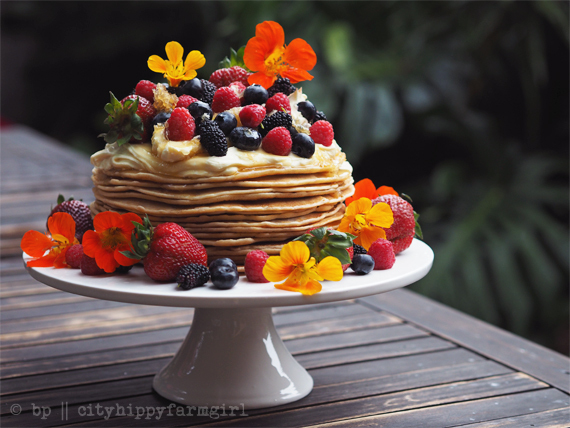 This entry was posted in Food Glorious Food, Photography, Rambles, Waffles and Digressions and tagged edible flowers, simple birthday cake, sugar free, swedish pancake cake by cityhippyfarmgirl. Bookmark the permalink. That’s a kind thing to say Irene, thank you. Hope your week is a good one. The most magical part of getting older is the discovery that you’ve made — each year is better than the last no matter the events that it contains. Evolving is an incredible gift. Evolving so is an incredible gift. I adore the word and the process. The idea of things (and me) staying the same, year in and year out is shudder worthy. Happiest of Birthdays to you Brydie! Lovely post, as always, and your photo is just beautiful. As we speak there is a large bowl of pancake batter resting on the bench (Sunday morning ritual) – I wonder if I can convince the boys to wait while I layer the entire family stack of pancakes? I tell you Saskia this pancake stack was so fun to pretty up, and it was just the starter with ideas. Pancakes…the corner stone of well, potentially quite a lot! It really is isn’t it, the sweetener that is…I need to remember it more often, especially on those crumbly kinda days….thanks Sam. Wait till you get to late 40’s ….it’s awesome!! That pancake is amazing. Happy birthday! Hello, I’m new to your blog, and haven’t commented before, but Happy Birthday! Berries and nasturtiums…two of my favourite things to pretty things up. Happy birthday B 🙂 What a beautiful stack of pancakes to celebrate with. Beats a dry old chocolate cake any day eh. Maths and I don’t work well together. Cups of flour I can work out, and that’s about it really…. No wonder we get along so well ;). It was Fibonacci day yesterday. I get Fibonacci. It’s nature and clever people decided to get with the program and copy natures model. That works. All of that other maths is just there to make the rest of us twitch. How can that be so? A celebratory cup of tea, a few strewn flowers on a bench top, well wishes from loved ones, ten minutes extra sitting down and reading? It doesn’t need to be much, but celebrating, yep, needs to be done I think. happy birthday – beautiful cake – thanks for sharing the joy of ageing – great to celebrate ageing – I sort of like seeing a few greys hairs on my head and wonder how I will feel when they take over – it is one of the nice things about not dying my hair that I see them creep up gently. Laura, let’s have a coffee and sort each other’s trials out…yep I’d love that. Meet you in the middle? Until then…losing your job is hard, there’s no denying that one, as you didn’t choose it. Whenever I’ve come up against a problem lately I’ve tried to attach the permaculture saying…”The problem is the solution”. Most of the time, it’s worked in some way, I’ve just needed to look at things differently. I would never be so presumptuous to say that’s what you need to do, financial security is a huge one, but if it helps, grab those little words and hold tight lovely.